The widely popular government education and training game America's Army is being released with new improvements and features to its core engine. Dubbed Special Forces: Overmatch, the new version will feature new vehicles and a much improved AI. Soldiers can now ride in fully up armored Humvee's which feature remote controlled gun turrets. The U.S Army's new ACU uniform also makes a debut in Special Forces: Overmatch. From the beginning, America's Army was a squad-based first-person shooter game set out to educate people and potential recruits about what the U.S Army is all about. In the game, gamers can explore different Army career opportunities, and find out what U.S Army training is all about. For example, gamers can actually explore what its like to be a medic and go through a medics training. 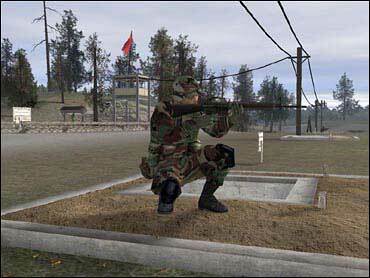 Similarly, gamers have to pass obstacle courses and elementary gun range exercises to simulate military training. Also featured in the new release Special Forces: Overmatch, is a new program that features real life combat heroes from actual wars. The program is called the Real Heroes program and the participating soldiers received Bronze Stars medals (for Valor) or higher, for their actions in the Global War on Terrorism in Iraq and Afghanistan. Combat veterans of the wars in Iraq and Afghanistan are feature in the game as non playable characters. Here you can read more about their biographies, and watch video documentaries. The soldiers provide a better account of their actions and discuss U.S Army customs. The soldier's likenesses will also be featured in small action figures hitting the market later this year. According to one actual Real Heroes member who spoke to GameCore at this years E3, Sgt Mathew Zedwick recipient of the Silver Star, said the figure "is just insane, it looks exactly like me, their so detailed". Sgt Zedwick will be one of the soldiers in the Special Forces Overmatch game. He admits playing in his spare time and claims the game is very fun. Launched in 2002, America's Army originally began as a public informational tool. But now the U.S Army is also using it as a highly cost effective training tool, to complement battlefield training. Virtual training in some cases better familiarizes soldiers with the equipment they use before actual costly combat training takes place. According to officials at the America's Army development team, it's impossible to play this game and not walk away with greater understanding of who and what the U.S Army is. Players are not forced to learn about the U.S Army, it is simply an option in the game. It is set out to reconnect with young people and let them know the U.S Army is all about integrity, and leaving no man behind. America's Army also has a unique version of relating U.S Army values to its users. If you don't follow the Rules of Engagement or ROE's you lose points and which will eventually lead you to being sent to Leavenworth prison. America's Army is not a game where we are rewarding you for killing terrorist. You are rewarded with U.S Army values and U.S Army reward systems. That is one of the main points to the game. Prior to America's Army everyone was forced to rely on Hollywood or the media for their perception of the U.S Army. One very interesting fact about America's Army, about 40% of the 7 million users who download and play America's Army are outside the United States. According to America's Army development staff, it's a good game and distinct from other military games on the market. The U.S Army isn't the only military branch with its own game. The U.S Navy also released its online game, Navy Training Exercise Strike and Retrieve Although its not a recruiting tool, Strike & Retrieve sets out to teach gamers what it takes to be in the Navy. Likewise, the Army National Guard released Guard Force in 2002 to also better describe the each soldiers mission and the duties of the National Guard. The National Guard and Rival Interactive will release another title called PRISM Guard Shield sometime in July that will be based on the unconventional application of new and emerging weapons and surveillance technologies in the war against terrorism. Although it doesn't have the official support of the Marine Corps, Close Combat First to Fight is one of the few games that details the United States Marine Corps. Created with the help of some active Marines, the PC game lets you carry out typical Marine Corps missions. Those interested in the military, or are just curious about America's Army should check it out. It really is more of an educational tool than a game, but gamers will have fun with it. In many aspects, America's Army is not your average video game. America's Army is rated "T" for Everyone (Content suitable for ages 13 and older) and is available on PC CD-ROM and Mac Computers.